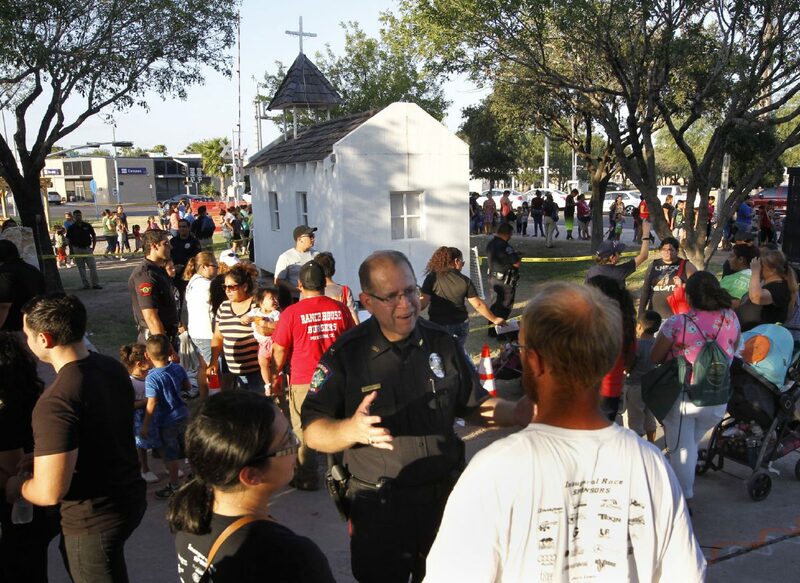 Mission Police Chief Robert Dominguez, center, talks with Brandon Mahan, right, and Morgan Hernandez during the National Night Out on Tuesday August 1, 2017 in Mission. 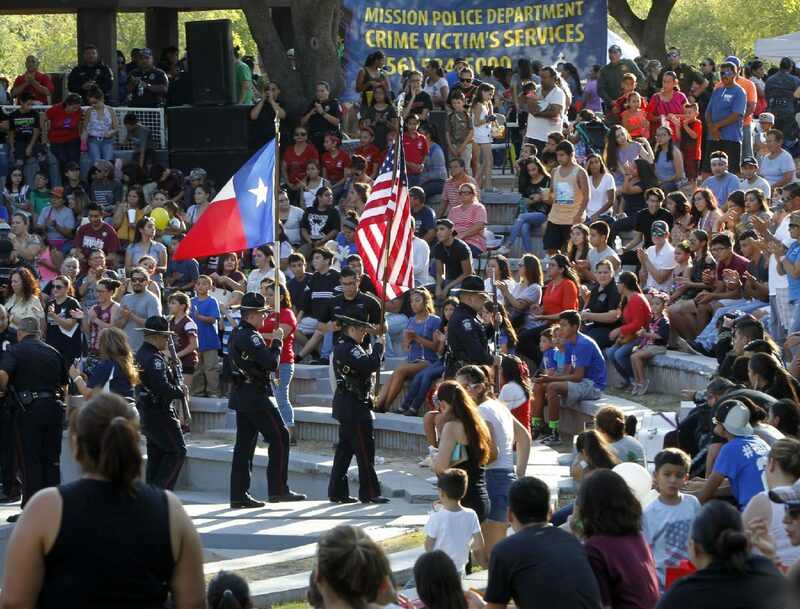 MISSION — Families and teenagers packed the amphitheater at Leo Peña Memorial Park as Mission Police Chief Robert Dominguez kicked off the city’s 22nd National Night Out on Tuesday. “How’s everyone today? Con ganas!” Dominguez asked the crowd. The annual event, held in communities nationwide to improve relations between residents and law enforcement officers, came amid uncertainty over how a controversial new law, known as Senate Bill 4, would affect interactions between police and Hispanic communities. The bill, which goes into effect Sept. 1, allows police officers to ask someone about their immigration status during any legal detention or arrest, such as a routine traffic stop. The law also bans cities and counties from prohibiting officers from cooperating with federal immigration authorities to enforce immigration law. A Mission Police honor guard presents the colors during a National Night Out event Tuesday August 1, 2017 in Mission. While some cities have questioned whether the law will create tensions between law enforcement and residents, Dominguez called SB 4 “business as usual” for his department, a position that echoes the stance taken by many South Texas law enforcement agencies. “Senate Bill 4 does not change how most law enforcement agencies in Texas already work,” wrote Gov. Greg Abbott, McAllen Police Chief Victor Rodriguez and Hidalgo County Sheriff J.E. “Eddie” Guerra in a joint May 23 Monitor editorial. But despite law enforcement’s assurance that officers will act no differently come this fall, a handful of small cities in Hidalgo County have come out against the law while larger ones, including McAllen, Mission, Pharr and Edinburg, have remained silent. Of the 21 cities in Hidalgo County, only two have voted to join or support a lawsuit filed by many other Texas cities seeking to invalidate SB 4. Mission Mayor Norberto “Beto” Salinas shared Dominguez’s view that SB 4 would not change anything and therefore found no reason to speak out against it or join other major Texas cities — such as Dallas, Austin, San Antonio and Houston — who are fighting the new law in court. While the city of McAllen has also remained noticeably silent on the issue, Mayor Jim Darling said he was personally against the law given McAllen’s ties with Mexico. Part of the reason the city hasn’t spoken out against the law yet is because it has had to pick its battles. In July, the city commission voted to sue the state over Senate Bill 1004, which prohibits cities from charging telecommunications companies that install transmitters in public right-of-way. But another reason is fear. Darling said the fact that McAllen is dependent upon the state for grants and reimbursements — notably federal reimbursement for more than $500,000 it has spent on immigration humanitarian aid — makes it harder to sue the state. “The retaliation fear (from the state) is real,” he said and referred to state Rep. Lyle Larson, R-San Antonio, who claimed Abbott vetoed nearly all of his bills in retaliation to Larson’s push for an ethics bill. This fear is shared by smaller localities like Peñitas, which hasn’t taken action on SB 4. Yet some small cities have been willing to run that risk even though they too rely on state funds. The La Joya City Commission voted to join the lawsuit against SB 4 on June 29, the same day the Palmview City Commission approved a resolution to file an amicus curiae brief. La Joya Mayor Jose “Fito” Salinas, who encouraged the commission to adopt the resolution, views the law as a form of racism against the state’s Hispanic community. “We need to unite and continue united, those of that can, to see if one day, they’ll listen and leave us alone,” Salinas said in Spanish after the resolution unanimously passed. And in neighboring Starr County, the Rio Grande City Commission is set to become the latest city to denounce SB 4 when it votes on a resolution to publicly oppose the law during its Aug. 9 meeting. The resolution is expected to pass. “I do believe that (victims and witnesses of crimes are) going to be less likely to come forward and unfortunately I think that the offenders or criminals are going to be the ones benefitting by this law,” said Rio Grande City Mayor Joel Villarreal. Because U.S. District Judge Orlando Garcia began hearing arguments in the lawsuit against SB 4 in June, it’s too late for Rio Grande City to join the lawsuit, which Darling recognizes would make McAllen passing a resolution opposing the law purely symbolic. But he’d still like the city commission to put it on its agenda. “Whether we vote for it or not, at least we (can) discuss it in public,” Darling said.